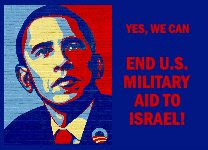 Help Influence the Obama Administration on ending the military aid to Israel and promote peace.Go and sign will ya? yup let support the petition. Let end these lowlife support to zionist regime. And this mean end those military support "toward anything Jewish". Let embrace a new Israel, emerge and live in peace and harmony with the new Palestinian nation. Wait a minute, did I say a new nation? Yup Palestinian people is stateless since the Great Britain end their ocuppation and Mandate subsequetly. The Palestine Mandate was assigned to Great Britain post-WWI peace under the Covenant of the League provision contained in the Treaty of Versailles circa 1920. For the next 28 years, Great Britain facilitate the establishment of a national Jewish home but not as a country. Declassify Winston Churchill document dated 1922 proved the essence of the facilitation. Illegal underground armed Haganah's Jew group terrorise the Palestinian Arabs, while masive influx of Jews immigrant from Europe and elsewhre, all under the under the watchful eye of the Great Britain. Not to mention the great Jewish lobbies in Europe and the US which is very effective I must say. This explained why in the day of may 14, 1948, when Ben-Gurion self-proclaims the State of Israel, Brtain dissolve the British Mandate the next day(May 15 1948). If that is miracle than perhap you should consider this, within minutes of the dissolution of the British Mandate, Harry Truman(tehn,the US President) granted de facto recognition of the State of Israel. merely 3 days later the Soviet granted diplomatic recognition of de jure. Yeah, a fair policy means, stop support to Israel, start supporting Hamas and the Ayatollahs!! fair policy mean as it sound fair not double standard, not hypocrisy, not turning blind eyes toward the regime zionist brutal slaughter of helpless paestinian people. yepp I know, it has been going on for many years, since the last 60 years to be exact, but it doesn't mean it cannot been change. Everthing in this world can be change exept dead. That what the prophet teach us. We cannot just merely pray and hope everthing will change to our liking. The holly Qur'an urged us to works to put the food on the table, to defend ourself with advanced weaponery, and even the rule of wars like dealing wth the POWs, wemen and children also got. It was written there long before the Hague Conventions or any moden International treaties to that matter. But unfortunately the muslim world in general has been negleted. Instead of become inventor like we used to be, we became heavily as a user. We have been bless wth the black gold and abundance resources yet it gone in the wind due to mismanegement(as inadequate people holding the jobs like in some of Middle East countries where almost the whole buch of the royal household have a keys position in the government,the holly book does foretold about the unqualified people holding the jpower too), corruptions and spend it on Harold's and the like. Now that the Israeli goverment became realy strong, (4th in the world) with almost 200 nuke and soon a squadrom of state of the art US made stealth bomber will arrive to their base. So teachically it very difficult to hedge the war looking at the Israeli army have at their disposal and the arabs possesion. And anything involving the security council touching the Jewish State will be a short live due to uncle Sam veto. Thus, we should change the US from inside. over the years,a lot of american poeple began too see the opposite, especially after the infamous lie about WMD and the war in Iraq. If we could contribute to this momentum and gave it more merits, more or less it will pressurise the current administration and hopefull tone down their blind support toward the regime zionist. And that mean a lot really..